Diagonals have more freedom of direction than the Cartesian axes - verticals and horizontals - because they are released from alignment with the image frame. Where Cartesians have a sense of stability or being supported against the effects of gravity, diagonals have the opposite - of falling under gravity. Diagonals thus have greater dynamism associated with a feeling of speed. Diagonals predominate the man-made environments as a result of linear perspective: non-centred straight lines or edges receding into the distance appear as diagonal lines. Diagonal lines are thus important elements for their ability to direct a viewer's eye: we are programmed to follow the line of a diagonal because we use it for depth determination, and for gauging the speed of movement of an edge falling under the effects of gravity. has more 'weight' in the case parallel diagonals because the tension created by one diagonal with the image frame, is reiterated by identical tension from the other diagonals. is strongest when there are multiple diagonals at different angles, where there is tension created between the diagonals as well as the image frame. In practice, parallel diagonals can be achieved from high vantage points using the compressing effect of a telephoto lens. Multiple convergent diagonals can be achieved in low or close positions with a wide-angle lens. Description: Masaccio's 'Trinity' began the Renaissance, the first time that realism was expressed since classical antiquity. It was composed as a Trompe-l'œil: an illusionary chapel to be viewed specifically from this point - the original entrance to the lower church in Basilica di Santa Maria Novella. The constraining rectangular form with its restricted formal viewing point is essential to the success of Masaccio's use of perspective. Description: (Close-up from the same position using the optical zoom function) Filling the frame to remove Trinity's grey surround increases its impact and enhances Masaccio's intended feeling of believable space.in which the humanity of the Father, Christ, the Virgin Mary and Saint John is portrayed. 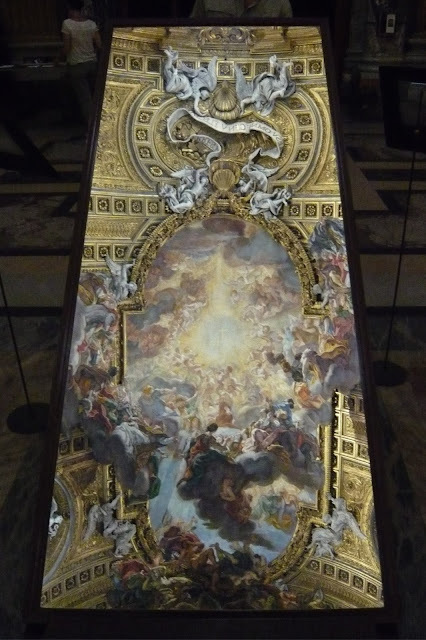 Description: The viewer's eye is first captured by the detail and luminosity of the beautiful baroque creation, then the elongated parallelogram shape of the frame-within-a-frame moves the eye upward accentuated by the 3:2 image frame shape. Only finally, at the top of the picture is there a female figure indicating that the framed image is a reflection of the ceiling above. Rectangles and their perfect forms, squares, are easily found as literal forms in man-made environments. They are highly unusual, implied or literal, in the natural world. Just as ellipses have a special relationship with circles, where ellipses are commonly interpreted as circles viewed at an angle not perpendicular to their plane; so do members in the group of symmetrical quadrilaterals. These are only seen as such when viewed along the central axis: a line passing through the exact centre of the shape running perpendicular to its plane. These are observed when rectangles are viewed on a perpendicular plane passing through the diagonal corners. These are observed when rectangles are viewed on a perpendicular plane bisecting two opposite sides. These are seen when rectangles are viewed along axes not passing through a point of symmetry. They would likely be resolved as two triangles. Thus not only are the points of a rectangle highly constrained in composition, but the angle of its viewing is too. Precision is of utmost importance when taking an image of a rectangle, as misalignments with the image frame are glaringly obvious. As a possible consequence of the due care required, deployment of rectangular elements lend a sense of formality, of controlled structure; and slightly less so with trapezoids and parallelograms. Description: This is what happens when inadequate clues are provided; one doesn't know what the picture or lines mean. The viewer is unlikely to be able to resolve the ambiguity of the image and will move without understanding its meaning - the delay period to realisation becomes infinite. Description: This picture makes much more sense as there are now enough visual cues for the ceiling fresco by Domenico Stagi (1782) to be resolved as a Trompe-l'œil. The embedding of a key element is achieved through misdirection - pulling away to sequester the important detail instead of stepping in to highlight it; and using geometries under Gestalt perception to lead the eye along a different route. Referencing a subject which is out-of-frame - its shadow, reflection, or person's reaction to it. Where something turns out to be other than what it first appears to be, such as a Trompe-l'œil. The trick to successful delay lies in the provision of adequate clues to bring about realisation. "That photography is truly a fine art has been proven for more than 100 years by a number of extraordinary photographers. The finest prints are always products of insight and excellent composition, subsequently carried through with impeccable technique." Bruce Barnbaum in 'The Art of Photography - An Approach to Personal Expression' (pages 284-285). That's it then. In one fell swoop Bruce Barnbaum has forced me to contemplate expansion of this project by pointing out that I may have put the cart of composition before the horse of insight. Drat! Actually this served only to crystallise what I've been coming to suspect (my wishlist on Amazon bears witness); that insight is the root of aesthetic communication. I now need to plan the routes of reconfiguration. Description: Non-directional light resulting from overcast skies produces a low-contrast scene where the contiguity of shape can be better appreciated i.e. the lines of the bridges are maintained because they are not interrupted by the casting of strong dark shadows, thus emphasising their horizontality. The horizontal lines of the bridges' edges extend into implied lines - the windows of houses on the right river-bank - through Gestalt's Principle of Continuity. The feeling of calm is reinforced by the ripples, which themselves gain horizontality with increasing distance - a by-product of linear perspective. become the frame of the viewfinder. as a consequence of the lateral arrangement of our eyes. Horizontal lines convey a sense of stability and calm, of having lower energy, of something coming to rest from the effects of gravity - the properties associated with a base-line. The horizon is the most common horizontal line which we are exposed to. There is a higher energy cost for us to perceive in the vertical plane. Scanning from top-to-bottom and perceiving vertical depth often necessitates a tilt of the head: a weighty structure whose stable articulation under gravity consumes not inconsiderable energy. Vertical lines convey a sense of movement, speed and energy: of something falling due to gravity or moving to overcome its effect. create balance, of an upright being supported by a baseline. When using these Cartesian axes, attention must be paid to align them exactly with the image frame, because their easy comparison renders misalignments glaringly obvious. Description: The top of the vaulted arch (out of shot) forms the apex of an implied triangle by the Principle of Continuity, with its baseline at the cornice. Four triangles are contained therein: two actual ones, above two implied triangles of the chapel arches. The shadows and the altar of the Doni Chapel imply further triangles. Principles of Proximity and Similarity combine to Common Fate - completing the larger triangles of the chapels, and implying two more by the fall of shadows within them. The concept of balance lies at the centre of visual composition. Balance is the establishment of equilibrium through the resolution of visual tension in order to give images harmony. Balance is achieved through symmetry, where elements of equal weight are placed equidistant from a central point or axis - everything 'falls away' from this centre evenly giving a measured, uniform feeling. The possibilities for symmetrical composition occur more frequently in man-made environments. Balance is achieved through asymmetry, where elements are placed at distances inversely proportional to their weight from the central point or axis - flow of movement from the centre occurs at different rates, accelerating and decelerating, giving rise to a sense of dynamism. In practice, the environment rarely provides us with perfect conditions, so the resolution of visual tension from multiple sources cannot be achieved in a formulaic manner, requiring us instead to resort to the use of developed intuition. Harmony may not be necessary or even desirable in the visual expression of an idea. The unease from a sense of unchecked falling, of suspension, or of a lack of resolution, can increase the intensity with which emotionally-charged content is experienced. So perhaps it would be better to say that the concept of balance, its presence or absence, lies at the centre of visual composition. Description: Inside the 12th century Florentine church of San Miniato al Monte, semi-circular Romanesque arches abound at its South-Eastern end. Grouped by proximity and similarity, the Principle of Common Fate is at play. The spread of light over the heads of Saints John Gualbert and Minias, depicted in the two large golden panels of the chapel, complete an implied circle begun by the chapel's vault under Gestalt's Principle of Closure. Since common fate is in effect, one completed circle causes all the other circles to be completed. The human eye has only a very small area where images are sharply in focus - about 3% of its central field. In practice this amounts to less than a hand's span at arm's length. So, we 'see' by building up a composite image of our surroundings; our eyes flick point to point in jumps called saccades, taking in small pieces of visual imagery at a time which our brain then puts together. When we look at a photograph or painting, the same process applies. The spatial arrangement of visual components affect the inferences we make: concerning their relationships to each other, and how they might coalesce into a comprehensive entirety. Our eyes might capture discrete images of a trunk, leaves, roots and branches, and yet our brain recognise their relationships and present us with a 'perceptual whole' of a tree. The way pieces of visual information or elements are 'placed' into a whole - an aspect of perceptual organisation - was studied by Gestalt (meaning "organised whole") theorists in 1920s Germany. Although some parts of Gestalt theory have not withstood scientific advance, its principles concerning visual organisation are still relevant today. Things which are seen together will be thought of as belonging together i.e. grouped. Example: If a row four identical items has a larger space in the middle, it will be seen as two groups of two. Things of which have characteristics in common will be grouped together. Example: six alternating rows of blue and yellow balls will be seen as three groups of blue and three groups of yellow. Items grouped through their proximity and similarity to each other are assumed to behave as one, sharing the same fate. The eye will want them to move together, or stay put together. Anticipations of a 'Common Fate' can be used to create visual movement and visual tension. The eye has momentum; once it is made to follow a path, it will try to continue along that same path. This principle predicts a viewer's preference for continuous figures. Example: a sequence of points will be joined up by the eye to imply a line, or a curving line (which will induce an eye to follow it) leads the eye to an object placed beyond the end the line. The mind seeks completeness. It has a tendency to fill in missing bits of information to make a whole; to complete simple shapes. This is develops out of the Principle of Continuity. Example: a curved line of constant radius with its ends closer together will be visually completed into a circle, or two convergent lines may have their other ends joined to complete a triangle. If there are two overlapping figures, the smaller is perceived to be in the foreground, the larger the background. This idea explains how we perceive which of two objects is in the foreground (the figure) and which is the background (the ground). Example: a net, formed of two sets of diagonal lines each at right-angles to each other, has a smaller blank oval outline in its centre. The oval will seen as the 'figure', and the net as the 'ground'. Areas bounded by symmetrical contours are seen as closed-whole figures, rendering the perception of symmetrical areas as 'figures' preferentially over asymmetrical ones. This principle is developed out of the Principle of Area. For the 'figure' to be perceived from the 'ground' there must be sufficient difference between the two. This is derived from the Principle of Common Fate and the Principle of Area. Figure-ground images, like those of Escher, exploit this for their ambiguity. The mind can join the dots. Groups, which alone do not contain sufficient information for the full context, can be brought together and their possible relations explored until the meaning of the whole emerges. Lacking sufficient information, the mind will act to fill in the empty space. The Principle of Closure demonstrates this. Lacking sufficient information, the mind will spontaneously move between the possible interpretations. For example, an absence of enough depth cues will cause a figure-ground inversion. Objects will still be recognised irrespective of orientation and scale. Description: Fields of sunflowers line the way from Classe back to Ravenna. This is a classic photograph where a normally static central placement of a single point, the flower's centre, lets the sunflower's pattern tell the story. Sunflowers owe their dynamic pattern to the Fibonacci sequence, which encourage the eye to trace clockwise or counter-clockwise spirals simultaneously. Multiple concentric circles are strongly implied, and the central point of focus is accentuated by the radiation of bright yellow petals whose tapered bases vector mildly inwards. they would have to close enough to each other to provide perceptual closure. Circles have an enclosing effect, tending to focus the eye inward towards their centre; therefore they are a powerful means of directing the viewer's attention into what they contain. There can also be a slight feeling movement along a circle's periphery which comes from its association with rotation. Naturally-occurring circles include bubbles, the sun, the moon, and organisms featuring radial growth. Ellipses, often interpreted as circles viewed at an angle, possess the same properties i.e. feeling of enclosure, and direction of attention inward to a focal point. Unlike a circle, ellipses have only two axes of symmetry and they have greater dynamism because the speed of visual flow changes - accelerating or decelerating - along its periphery. That's right. The first limitation I've come across in the blog is that the tag/label field has a maximum of 200 hundred characters only! Google doesn't anticipate that someone would use cross-referencing to the extent that I do. It's to prioritise the index/concept numbers (e.g. 01.02.3) over the concept names (e.g. Concept: frame shape). The concept numbers will be tagged as completely as possible; followed by the concepts by name, in relevance order. Not ideal, but the small 'bright side' is that the limit forces me to identify the priority order of concepts. Aerial perspective (from atmospheric haze), colour perspective (warmer hues in the foreground, cooler hues in the background) and tonal perspective (higher contrast at the front, decreasing as distance increases) are at play. Viewing lines are directed in zig-zagging diagonals to the image frame, creating a feeling of dynamic energy.